Are you looking for the best shower base to uplift your bathroom’s décor and sophistication? There are overwhelming options of shower bases available in different sizes, shapes, features, and colors to match the elegance of your bathroom. Also, these pans come in various materials which include ceramic, stone resin and acrylic. There are lots of options available in the market, choosing the most appropriate one can be extremely confusing. A shower base can make a world of difference in your modern bathroom and hence, it is necessary to choose the right one. Here are our best picks by considering all the various factors for the ideal shower base. This shower base is a complete package of innovative features by a reputed company called Dreamline. DreamLine SlimLine is leading Company has been involved in the manufacturing of classic and durable bathroom fittings for many decades. Available in trendy white color and dimension of 36x 60x 2.75 inches, this shower base can be the ideal unit for remodeling your dream bathroom. 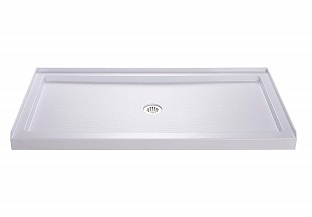 This Slimline Rectangular Shower base has a center drain which looks authentic and is easy to drain. The simple 3- wall alcove installation facilitates easy fitting against the studs for unfurnished walls. Also, the integrated tile flange makes installation easy and provides high water-proofing. Made up of premium quality ABS/ Acrylic material, it provides a timeless design which will not corrode or rust. The composition of the shower base allows high resistance towards scratch and stain making it durable and user-friendly. The high-quality fiberglass reinforcement transforms the shower base into an ever-lasting unit which will augment the modern appeal of your bathroom forever. Apart from the solid multilayer structure, it has a slip-resistant textured floor pattern and is cUPC certified. The durable construction avoids any flexing of the base and can easily accompany a 2-inch compression fitted drain. Fiberglass reinforcement for ultra-durability and stability. Sturdy base made up of quality Acrylic ABS material. A slip-resistant textured floor which is easy to clean. Scratch and slip resistant body. Integrated tile flange and a single threshold for high water-proofing. This DreamlineSlimline shower pan is extremely cost-effective and durable unit which will complement your bathroom forever. But, if you are looking for a unique and trendy design, then this might not be the most appropriate unit. 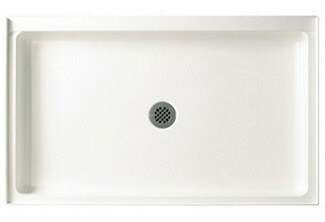 To enhance the elegance of your bathroom, this single threshold shower base by Kohler K-9394-0 is the ultimate choice. Kohler is a renowned brand which is known for providing a shower base with an amalgamation of quality and long life. Available in a square shape with a dimension of 48x48x3.9 inches with a covered drain, this shower base is sure to augment the aesthetic feel of your bathroom. The transitional beauty of this Archer suite can be accredited to the unique blend of subtle design elements used in intricate facets of jewelry. The covered drain not just adds a distinctive flair but provides additional comfort while bathing. The solid construction comes with a mixture of fiberglass addition for durability and glossy finish. Also, it has a smooth slip-resistant floor which protects you from any unfortunate accident and is easy to clean. This archer receptor by Kohler creates a timeless, trendy appeal in front of your guests. The Alcove installation process is straightforward and can easily be done with professional help. Beautiful and unique design for enhancing the contemporary charm. High waterproofing and safety with a low threshold. Covered drain for added comfort and a sophisticated look. Fiberglass reinforcement for long-lasting performance. Although the material composition is not top-notch, the modernity and design motifs it provides makes it an outstanding choice. However, fiberglass reinforcement provides utmost durability and stability to the unit. The white shower base looks stylish, but this biscuit color single threshold by DreamLineSlimLine 36 x 48 looks authentic and pleasing to the eye. 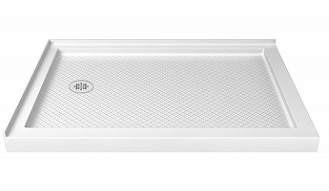 This Dreamline shower base comes in a modern and low profile design which can impose a remarkable stance on the complete texture of your bathroom. Available in 36 x 48 x 2.8 inches dimension, this unit by a world recognized company endows a reliable and high-quality experience. Not just it is trendy and can complement your bathroom but is ultra- durable and sturdy. The best advantage of this shower base is its higher cost-benefit ratio than usual bathroom tiles and easy installation. Made with solid and superior Acrylic/ABS material augmented by fiberglass addition, it is meant to provide endless appeal to your bathroom. No one can doubt its strength and performance because of the amazing material composition. The surface is scratch and rust resistance which is extremely easy to clean. The high resistance to stain and incorporation of a premium textured floor prevents slips and high wear. The construction eliminates the chances of base flexing thus facilitating quick and cost-effective installation. This Dreamline shower pan worth every single penny and will enhance the aesthetic of your bathroom forever. But, the design seems very simple and someone looking for a unique style will not appreciate it much. Swanstone is a global leader in kitchen and bath industry and provides the ultimate solution for bathroom and kitchen fittings. The shower base delivered by Swanstone are evolved from high quality and durable material. This Swanstone Single threshold shower base comes in a dimension of 34-inch length, 54-inch breadth and is 5.5 inches deep. The Veritek material used is extremely sturdy, solid and durable made for heavy-duty. Swanstone even claims that the material used for the construction of this shower base is even better than premium double skinned Acrylic. With no surface coating to avoid chip or crack, the shower base can be cleaned perfectly with normal household cleaners. The shower base also decreases the chance of slip with its pebbled textured floor. The stylistic white color and solid design add up to the grace of your bathroom. Also, it has fit flow drain design and 3 wall alcove installation. It can be best used for a smaller sized bathroom. With highly durable and solid design, easy installation and superior material, this shower base could be a great choice. But, the only thing which is pulling us back is the high cost of the unit. If you are concerned with quality, strength, and durability, this shower base is definitely an integrated package to consider. Available in stylish white color, this product by Bestbath can truly transform your bathroom. Bestbath is a reputed brand in the market which is providing all in one bathroom solution to its clients for many decades. 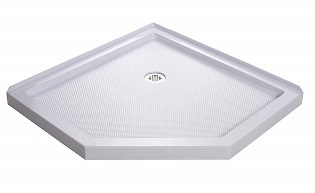 This shower base has a dimension of 30 W x 30 D x 6 H inches and requires no mud setting. With high-quality fiberglass material and reinforced gel coat finish, it is made to exhibit excellent durability. Also, the gel coat finish makes it scratch and stain resistant. The shower base facilitates easy cleaning and offers exceptional strength and performance. 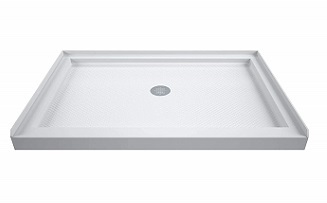 This shower base has a slip-resistant textured floor for reliable and safe showering. It comes with installation instructions and materials to allow even the novice to install it. This squared shape and low-step shower base come with an incredible, outstanding performance. Also, you won’t require cement for installation due to an extremely sturdy base. The base threshold helps in waterproofing and the maintenance is super easy. You will also get a Technical PDF sheet for any details of materials. Gel coat finish and fiberglass material help avoiding scratch and strain. A bit expensive than other shower bases. If you are looking for a trendy and durable Shower base, you must try this pan from Bestbath. Although it is a little bit expensive, the features make it one of the best units available in the market so far. A good quality and affordable shower base to exude a subtle accent to your beautiful bathroom. Currently, there are many modern shower base with maintains cheap design to provide you with a clean and glossy look. But, this white-color DreamlineSlimline Shower base is a clear exception with its high-quality Acrylic/ABS material. The remarkable Fiberglass reinforcement and glossy Acrylic material complement each other for providing an optimum level of durability. Also, it decreases the chances of slip with its slip-resistant textured floor. The usage of acrylic material helps the base to avoid scratch and stain. Dreamline has emerged as the top name in Bathroom fittings due to its superior quality and durable built. Available in the dimension of 34×48 inches, it is sure to match your bathroom style and add to it. This shower base by Dreamline is an ideal choice for a medium-sized bathroom. Certified by cUPC, this rectangular shower base meets the highest quality standards. This shower base comes with an easy installation system and 2-wall corner fitting. Every threshold arrives with two sides integrated tilling for boosting water-proofing. If you are looking for a pocket-friendly yet a powerful shower base, this Dreamline double threshold pan will definitely not disappoint you. With high-quality, durable materials and the cUPC certification tag, this shower base will complement your bathroom for many coming decades. If you are looking for a blend of trend, strength, and durability, you must consider buying this Sterling Ensemble Shower Base. It is built by keeping in mind, comfort, and quality. 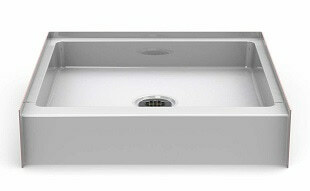 The best thing about this base is that it can replace your 5 feet bathtub or space easily without having to remove the drain. Sterling is a product by a renowned company, Kohler. This top brand company is well- recognized for its excellent bathroom and kitchen furnishing goods. The shower base is crafted for creating a soothing look and for delivering an unmatchable experience. Made up of solid Vikrell material, this ensemble end drain shower base resembles ultimate strength and high performance. The durable high-gloss Vikrell material helps to provide a shiny and smooth surface which is easy to clean and maintain. It also meets the consensus standards laid by ANSI Z124.1.2 and CSA B45.1. The lower threshold makes it easy to step over while ensuring high water-proofing. Also, the trendy white color design will supplement the elegance of your modern bathroom and will go hand in hand with it. This shower base is perfect to provide you with a customized look without having to worry about a tile receptor. Made up of solid Vikrell material for ensuring long-lasting performance. Abides by the guidelines prescribed by ANSI Z124.1.2 and CSA B45.1. Sterling 72181120-0 Series is highly efficient and beautiful shower base but is recommended for the medium or smaller sized bathroom. Also, the price is on the higher side as compared to the Dreamline Units. 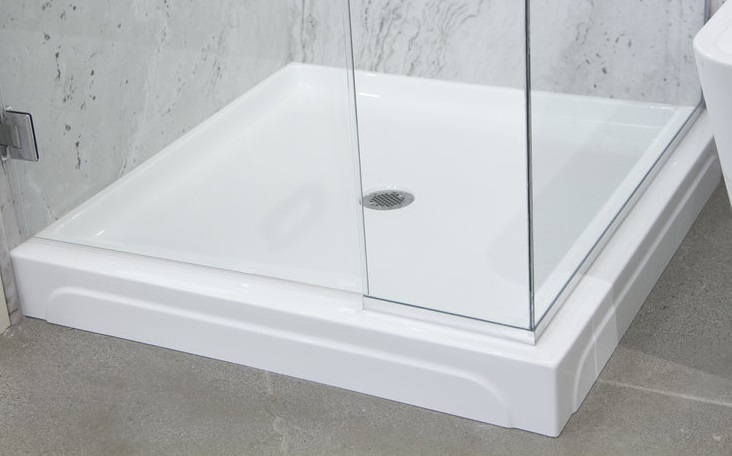 Packed with amazing features, this Neo-Angle Shower base by Dreamline is a choice for a modern bathroom. The Premium Acrylic capped ABS material used in its construction offers superior durability and toughness. With a corner-drain location and a trendy white glossy look, this shower base is certain to endow you a contemporary charm to your bathroom. Also, the unique Neo-angle design is sure to impress your guests with its great panache. The leading Global brand, Dreamline has immersed durability to the modern design and came up with this impressive shower base. This integrated package is available in 36 x 36 x 2.8 inches dimension and has many special features. Apart from its amazing design, the acrylic material a fiber-glass addition offers scratch free and stain resistant shower base. It is a highly durable alternative which is cost-effective as well. The cUPC certification and finest composition of materials signify the quality of this shower base. The SlipGrip Textured floor offers high resistance to slip and is made to withstand wear and high pressure. The ultimate solution to what you are looking for and which will best for you? This shower base with a trendy design, simple installation, long-lasting and easy to clean. This unit by Dreamline is perfect except the surface is not very smooth. Selecting one shower base can be tricky due to the overwhelming options available in the market. There are various aspects which one must look on before purchasing the best shower base for you. Most affordable and powerful material in the construction of shower base is Acrylic. Even, the stone is much common along with Ceramic but can be expensive and difficult to install. Acrylic with fiberglass reinforcement offers easiest fitting, high durability and pocket-friendly option. The affordable Acrylic with fiberglass offers high resistance towards scratch and stain which is also easy to clean. However, you can go for rich and expensive designs. The most expensive shower base is made from vitreous china or Royal stone which is available in the market. Sizes and shape are shown upfront and are pre-determined to the buyers. There is high flexibility offered to the customer based on dimension so that they can choose the most appropriate shower base for themselves. Popular sizes are around 36×36 inches, 48×48 inches, 36×60 inches, and 60×32 inches. The shapes vary drastically where the most common are simple square, rectangular, neo-angle and Pentangle shapes. If you are choosing the best acrylic shower base, it will come with a glossy finish. There are various colors available for different units, but the most common is the white base. White color looks elegant, and it can complement any bathroom. Another reason is that other colors easily go out of fashion and replacing them every time is not practically feasible. You can specifically go for a certain color which matches the shower curtains, towels, blinds, and walls of your bathroom or else you can go for white. What precautionary care has to be taken before installing a shower base? First of all, ensure that the subfloor is leveled otherwise the base can crack. Also before installation, special care has to be taken to joints between wall tiles and base to prevent water penetration. Not just it can lead to structural damage but can also lead to excessive and expensive remedial work. Also, in some cases, the whole shower base need to be refitted and replaced causing an unbelievable investment. How difficult is to clean a shower base? Many shower base comes with high-quality Acrylic/ABS capped material for stain resistivity and easy cleaning. You can use normal household cleaners for cleaning the surface but it may take some time. You can use a cloth or sponge along with non-abrasive cleaner to refurbish its appeal. So, which is the right shower base for you? Well, any one of these listed top picks can be a great choice for remodeling your bathroom. By keeping all the essential factors in mind, we have listed the best shower base which can augment the grace of your bathroom. You can buy anyone of mentioned shower base as per the desired size and design. Starting with the elegance till the material composition, these shower bases will best for you a perfect package of quality and durability to cater to the aesthetic feel of your bathroom. toiletlounge.com is a participant in the Amazon Services LLC Associates Program, an affiliate advertising program designed to provide a means for sites to earn advertising fees by advertising and linking to Amazon.com. Additionally, Coolidealbike.com participates in various other affiliate programs, and we sometimes get a commission through purchases made through our links.